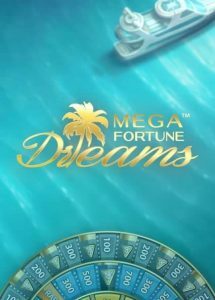 Mega Fortune Dreams is a game that gives you a taste of what your life could look like if you’re a millionaire. And millionaire you could well become if you play this game because it offers a progressive Network jackpot slot! In fact, this 5 reels, 3 rows, and 20 paylines games keep on making the headlines for paying out Millions! Yet, this game has the potential to change a player’s life in more than one ways! Indeed, the game itself, if we don’t take into account the progressive jackpots, offers an excellent max win which could see players pocket up to 1,680,000 coins. But let’s not forget to mention that the bonus game could also see players win up to 6,000 coins thanks to the 10x multiplier in the Free Spins bonus. Bonuses & features: Free Spins, Multiplier, Re-Spins, Bonus wheel and Progressive Jackpots. Highest-paying symbol: 5 Wild Symbols awards 5000 coins. When you play Mega Fortune Dreams video slot, you’ll have access to 2 different features. The first one is, of course, the Free Spins bonus and it can reward you up to 20 Free Spins, depending on the number of Scatter that landed in view. During the Free Spins feature you’ll have access to increasing Multipliers (up to 10x). Plus, you’ll also have the chance to trigger Re-Spins too. The second slot bonus you can trigger is the 4 tiers bonus Wheel, and it’s where you’ll have the chance to win any of the 3 jackpots advertised at the top of the casino game. Each tier can either reward you with an instant coin win. Alternatively, if you land on an arrow, you’ll move up to the next stage. If you reach the final stage of the bonus wheel, you’ll win the Mega jackpot! The Scatter symbol in Mega Fortune Dreams video slot is easy to spot since it’s a huge diamond with the word Scatter written on it. As for most games, the Scatter symbol will trigger the Free spins bonus we’ve described above. But in the Free Spins, it can also reward you with extra rounds and/or multipliers. The Wild symbol, on the other hand, will not only help you complete winning combinations. But it will also trigger a Re-Spin when landing on any reels during the Free Spins feature. The bonus wheel symbol is easy to spot. It will trigger the jackpot feature we described above when 3 instances appear on consecutive reels. It’s worth knowing that the bonus wheel symbol can appear in both the base game and in the Free Spin. And in the Free Spins bonus, this symbol will always award you a Re-Spin as well. When it comes to Mega Fortune Dreams, the headlines speak for themselves! In fact, playing this game not only gives you the opportunity to make all your dreams come true. But it can also give you access to fame if you’d like. Most Mega Fortune Dreams winners get the red carpet rolled out for them when they win at any casinos mentioned on casinoservice.org/UK!